A slight variation of the classic bouncing ball model: a ball bouncing down a set of steps. The instants of impact are detected using zero crossings, up(ground(x) -. y), which trigger a reset of the balls vertical velocity to -0.8 its previous value. In the basic version of the program, the ball ‘falls through the floor’ due to limited floating-point precision. With hybrid automata, it is instead possible to switch to a sliding dynamic when the balls vertical velocity becomes very small. There is also a simpler model where the ball bounces up and down on the spot. We manually track the bias and slope for integers representing rational values. We use int for the integer values rather than int8. This value is a constant 20°C, but it is encoded as a fixed-point integer so that it can be compared directly with the digital temperature value from the environment model. The reference temperature has a value between 0 (-15°C) and 255 (84.609375°C), i.e., a resolution of 0.390625 per bit (0.390625 = 5 / 256 / 0.05). boiler: a signal that switches the boiler on (1) or off (0). Off: The boiler is off. The LED is flashed red at 0.1 Hz (5 secs off, 5 secs red). On: The boiler is on. The LED is flashed red at 0.5 Hz (1 sec off, 1 sec green). The controller always remains in the Off state for at least 40 seconds, after which it will switch to the On state if the temperature is less than the reference temperature. The controller may not remain in the On state for more than 20 seconds. It will switch to the Off state if the temperature becomes greater than the reference temperature. The on state contains an internal automaton that stays in a High state from t = 0 until the very first time that the measured temperature exceeds the reference temperature (this is ensured by entry-by-history from Off). The reason for this additional complication in the original Stateflow controller is not clear; perhaps the intent was to heat at a faster rate the first time the system is switched on? In our model, the effect is to delay an exit from the On state by one reaction the first time the reference temperature is attained. Boiler is a hybrid model of the boiler temperature and a digital thermometer. The boiler temperature is modeled by a single integrator with an initial value of 15°C. This value (cools) at a rate of -0.1 / 25 when the boiler is off. It changes (heats) at a rate of 1.0 / 25 when the boiler is on. The digital thermometer is modelled in some detail. Effectively, it takes a floating point temperature value in degrees centigrade and returns an integer between 0 and 255 representing that value (see the discussion above for the reference temperature). The sensor itself has a bias of 0.75 and and a precision of 0.05, i.e., the output voltage V is a function of the temperature T: V = 0.05 * T + 0.75. An analog-to-digital converter (ADC) converts this voltage into an integer. By scaling, quantization, and limiting. Scope is a discrete node. 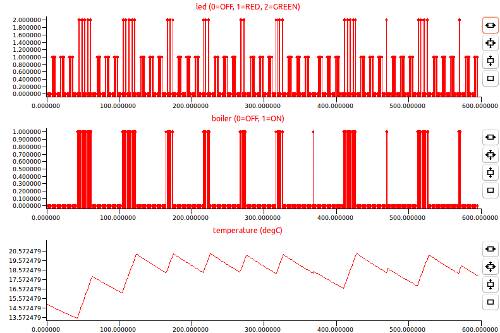 It is triggered every sample_period to plot the LED output, the boiler command, and the actual temperature against time. Note that, even though all of these signals are continuous, they are plotted at discrete instants (as plotting is a side-effect) and the graph is thus (linearly) interpolated. The simulation output shows a staircased increase in temperature from 15°C at t = 0 to the 20°C just before t = 500. The initial rising edges have a slope of 1.0/25 (the heating rate) and a duration of 20 seconds (the maximum amount of time in the On state). The initial falling edges have a slope of 0.1/25 (the cooling rate) and a duration of 40 seconds (the minimum amount of time in the Off state). After reaching the reference temperature, the controller switches on and off to oscillate around the set-point. The LED will flash green (2) during periods of heating, and red (1) during periods of cooling, i.e., when not heating. Note that the timing constants in the program have all been divided by 100 to speedup animation of the system. Another way to achieve the same effect would have been to use the -speedup option available in compiled Zélus programs. 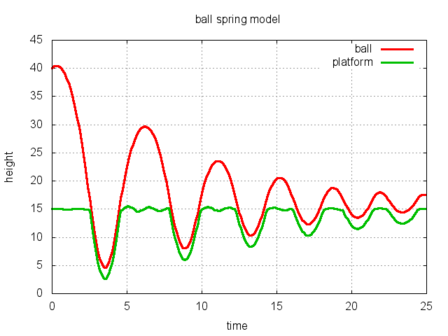 A ball bouncing on a spring with damping. This example is programmed as a two-state automaton. 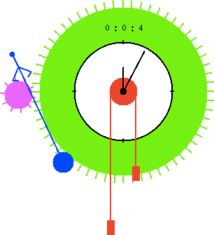 In the first state the ball and spring move separately: the ball decelerating and eventually falling back to the spring, and the spring oscillating with less and less energy. The second state is entered when the ball lands on the platform, in it the ball and platform move together until the ball becomes unstuck. The calls to OCaml graphics for animating the system are written directly in a discrete node. Additional calls are added to log the system state to a file for graphing with gnuplot. This example comes from Chapter 10 of Åström and Wittenmark's Adaptive Control (2nd edition). It involves the control of a simple process using adaptive relay feedback. Together, the process and relay incite limit cycle oscillations, giving systems with high feedback loop gain. "The nominal values of the parameters are K = 3, ..., and alpha = 20." "The process gain is suddenly increased by a factor of 5 at t = 25." The models are tested over a period of 50s in response to a command signal which starts at 1 initially, drops to 0 at 17.5 seconds, and then rises to 1 again at 35 seconds. The command signal is defined using a hybrid automaton in a node called command. We implement them in a node called process using a hybrid automaton and a generic siso_3o node that takes the state-space matrices as tupled arguments. The first model comprises a simple feedback loop—relay, process, and inverter—that tries to follow the reponse of a reference model to the command signal. Other elements will be added successively. We express it in a node called reference using a generic siso_2o node. The response of the reference model to the command input is shown in red below. The actual output of the feedback loop is shown in blue. The relay is modelled in a node called relay using a hybrid automaton that alternates between High (output = d) and Low (output = -d) states in response to zero-crossings on its input signal. The relay's value is shown below. The next model augments the basic model with a compensation network that adds a phase lead of -π. The compensation filter decreases the amplitude of oscillation while maintaining the reponse speed, as can be seen in the simulation results below. A gain changer is added in the final model. It uses so called up logic to speed up the controller's reponse. A gain changer increases the relay's amplitude (d) when a specified tolerance (e_l) is exceeded. 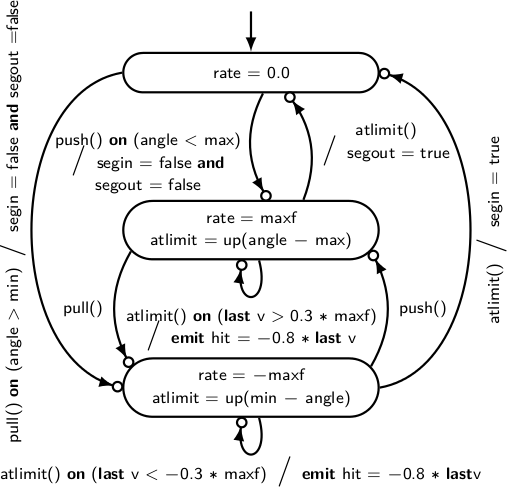 This logic is readily implemented in the gain_changer node using a hybrid automaton. The simulation results show that the new controller responds with smaller amplitude oscillations to the system with higher gain, without losing performance for the system with smaller gain. 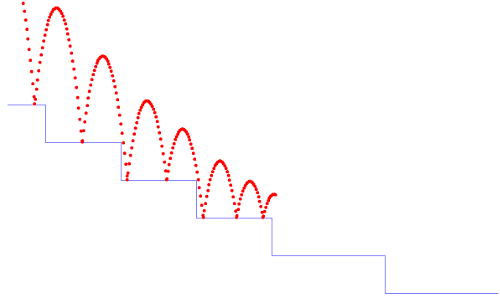 The effect of the gain changing logic on the relay output is evident in the exponential envelopes on the signal shown below. This example is based on example 6.8 in Edward A. Lee and Pravin Varaiya, Structure and Interpretation of Signals and Systems, Second Edition, and the Ptolemy II model by Jie Liu, Haiyang Zheng, and Edward A. Lee. The model comprises two sticky round masses, each on the end of a spring. The other ends of the springs are tied to opposing walls. After the springs are compressed (or extended) and released the masses oscillate back and forth, and may collide. After a collision, the masses remain stuck together until the pulling forces from the springs are greater than a stickiness value (which decreases exponentially after a collision). and total = 0.5 *. m1 *. v1 *. v1 +. 0.5 *. m2 *. v2 *. v2 +. 0.5 *. k1 *. (x1 -. p1) *. (x1 -. p1) +. 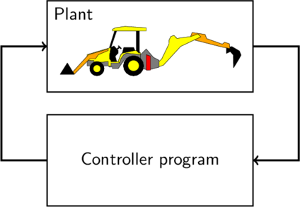 The Backhoe loader is an original example that we developed to teach reactive programming. The original programming challenge focused on the discrete controller, but expressing the continuous dynamics is also an interesting programming problem, as is interfacing the two models. The discrete controller receives input from sensors which are defined inside the continuous model. There are sensors for each of three buttons (stop_button, extend_button, and retract_button), for indicating whether the legs are fully retracted (legs_in) or fully extended (legs_out), and for indicating whether each of the rear segments is fully retracted (*_in) or fully extended (*_out). There are control signals for three lamps (alarm_lamp, done_lamp, and cancel_lamp) and for triggering leg extension (legs_extend), leg retraction (legs_retract), and stopping leg motion (legs_step). There are three control signals pel segment: setting an internal valve for pushing (*_push), or for pulling (*_pull), and for driving hydraulic fluid through the valve (*_drive). It is assumed that a lower-level controller maintains a segments position when it is not being driven. Each segment is modelled using set of equations that include a hybrid automaton. Two types of dynamics are modelled: moving and stopping with momentum (modelled as a Proportional-Integral controller) and bouncing at the limits of movement (modelled as instantaneous reset). Further details can be found in the paper Zélus: A Synchronous Language with ODEs. This model was made to celebrate Albert Benveniste's 65th birthday in honour of “The old fashioned Signal watch”. Move: the cogs are free to turn. Stop: the cogs are trapped by the escapement. Exhausted: there is no energy left in the masses. Setting: energy is added to the mass system. A sound is emitted whenever the escapement catches (on tic and toc). The spacebar is used to reset the position of the masses. The system state is drawn by an external (OCaml) function called draw_system. A sound is emitted whenever the escapement catches (on tic and toc). As an added bonus, the entire system can be made to swing back and forth. The watch then behaves as a pendulum controlled by an automaton with two modes. Stop: The pendulum does not move. 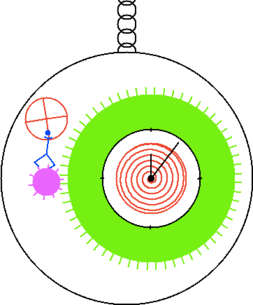 Move: The pendulum starts moving with a fixed initial angular speed. The user can switch between the two behaviors by pressing the m key. The system state is drawn by an external (OCaml) function called draw_system. This example is taken from the paper: Conflict Resolution for Air Traffic Management: A Case Study in Multiagent Hybrid Systems, Tomlin, Pappas, Sastry, 1998. A conflict resolution manouever is considered when two planes have entered into each other's alert zones. 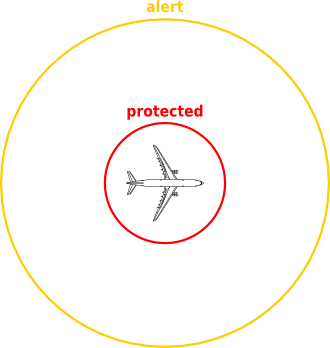 The system aims to ensure that neither plane ever enters the other's protected zone. In the model, the position and heading of Aircraft1 define, respectively, the origin and direction of the positive x-axis of a relative coordinate system, in which the position of Aircraft2 is specified. The heading of Aircraft2 is specified relative to the positive x-axis. The initial condition in the model is that the aircraft are cruising outside each other's protected zones, but inside each other's alert zones. Cruise until aircraft are alpha1 miles apart. Make a heading change of delta_phi and fly until a lateral displacement of at least d miles is acheived for both aircraft. Make a heading change to the original heading and fly until the aircraft are alpha2 miles apart. 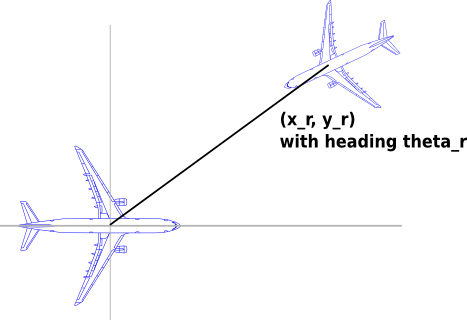 Make a heading change of -delta_phi and fly until a lateral displacement of d miles is acheived for both aircraft. Make a heading change to original heading and cruise. Note that, in the model at least, the heading changes occur simultaneously and instantaneously.